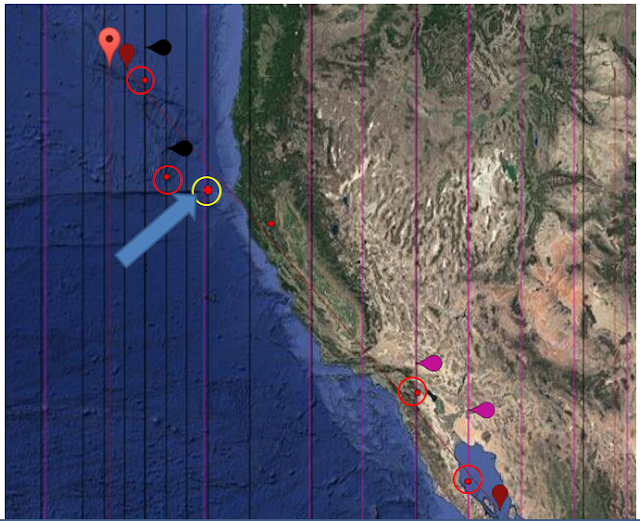 Earthquake Prediction: CALIFORNIA: How to locate the earthquake of 3-Sept-2016 using FDL !! CALIFORNIA: How to locate the earthquake of 3-Sept-2016 using FDL !! The earthquake of 3rd Sept. 2016 is the last 5.6R earthquake to take place in the California Region. We show this earthquake in yellow circle and with an arrow pointing to it. The other RED circled dots are prior earthquakes >5R this year, from 1-1-2016 todate. 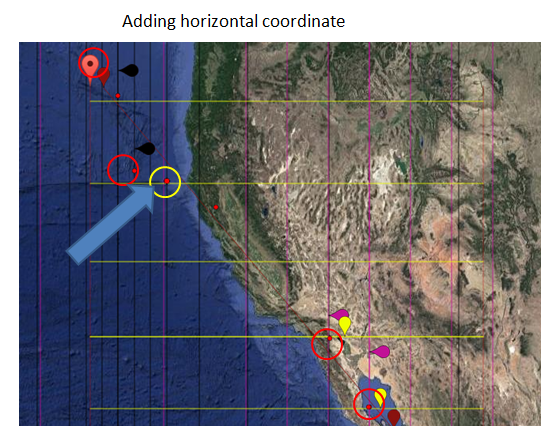 Here follows a method to locate future event location based on previous earthquake locations. (This has been published by us already we simply apply it here ). We take a set of fibonacci lines the black vertical through two previous locations as shown and another two using a different set, and the magenta colour. When we apply those, they seem to colocate exactly on the 3-Sept-2016 event. To complete the picture, we add a horizontal set the yellow color, using the lower two points. When we unfold the fibos they go through the location we point using the arrow, the 3-9-2016 event.